Lyndon Baines Johnson, also known as LBJ, was born in Stonewall, Texas on August 27, 1908. He was born in a small farmhouse in the poor part of town. His parents were Samuel Ealy Johnson, Jr. and Rebekah. He had three sisters and two brothers. When he was little his grandfather told everyone that he would grow up to be a United States Senator. When he was a child he liked to talk a lot. Lyndon was elected president of his 11th grade class. He graduated from Johnson City High School in 1924. In 1926, Johnson enrolled in Southwest Texas State Teacher’s College. He quit school in 1927, but he went back one year later. He graduated in 1930. He was a teacher before he entered politics. In 1927, Johnson taught mostly Mexican children at Welhausen School. He then taught at Pearsall High School in 1930. He also worked as a teacher of public speaking at Sam Houston High School. On August 1, 1934 Lyndon met Claudia Alta Taylor. The next day he asked her to marry him, but she did not answer the question. Seven weeks later she agreed to marry him, and they got married. 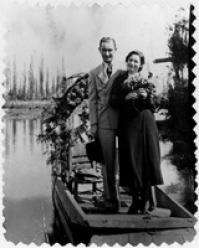 They were married on November 17, 1934. They went to Mexico for their honeymoon. 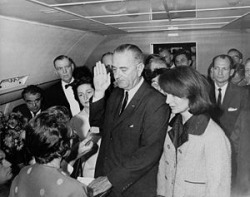 Lyndon B. Johnson taking the oath to become president on an airplane. Before he became the Vice President and the President, he served as a United States Representative and a United States Senator. Lyndon was John F. Kennedy’s vice president. He became the president when John F. Kennedy was assassinated. Assassination is when a person who holds an office is killed. He was later elected president in 1964. While he was the president the Vietnam War was being fought. When he went into office he sent more soldiers to fight in it. He encouraged the Space program. While he was president three astronauts circled the moon. Lyndon B. Johnson died on January 22, 1973 at his home in Texas. He died from his third heart attack. His health was bad because he smoked and drank most of his life. He was buried in his family cemetery. 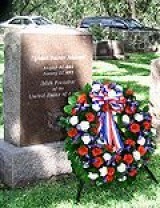 His grave can be seen by people who visit the Lyndon B. Johnson National Park in Stonewall, Texas. Lyndon helped Americans in many ways while he was president. He had a plan to end poverty and discrimination called the Great Society. In the Great Society he passed Civil Rights laws, developed Medicare, and Medicaid. He convinced Congress to pass the Civil Rights Act of 1964. He got the Voting Rights Act in 1965 passed. It did not allow any discrimination based on color. 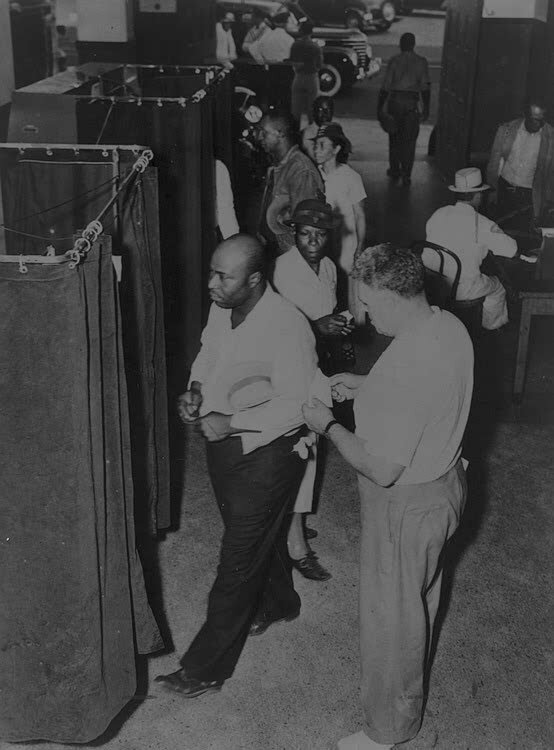 This allowed many African Americans to vote for the first time. Medicare is a program that helps elderly people pay for health care. Medicaid is a program that helps people without a lot of money pay for health care. 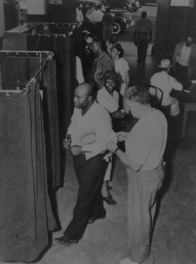 Afrian Americans voting for the first time. 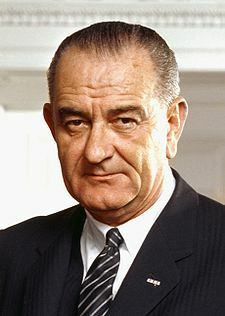 Lyndon B. Johnson became president because of a sad thing. The country was sad because President John F. Kennedy had been shot and killed. The country was still discriminating against African Americans when Lyndon became president. He worked very hard and had to stand up to many people to try to get people to treat everyone fairly. There was a war occurring at the time Lyndon became president. He had to make many hard decisions about what to do. -When he was 4 years old, he would run to the school to play at recess with his cousins. -He graduated from high school when he was fifteen. -He once worked as an elevator operator. -Lyndon had three TV’s in his Oval Office to keep track of all channels. At that time there were only three networks. -Johnson liked to take visitors on a 90 mile-per hour ride around his ranch in his Lincoln Continental. -Johnson has been the only President to take his oath to become the president from a woman. -He once had a barbeque on the roof of the White House. -Sometimes he would lift up his shirt to show off his scars. -He had two pet beagles. Their names were Him and Her. -He loved to give people gifts. He really liked to give people electric toothbrushes. He said that then people would think about him first thing in the morning and last thing at night.